RENOVO SOLUTIONS can provide integrated solutions for managing and servicing the maintenance of all the assets within a laboratory, regardless of manufacturer. Our customized service delivery solutions will uniquely address your laboratory’s needs to ensure overall optimization and lab efficiency. As a single source solution provider, we can simplify vendor management for all your lab equipment and instruments in which we assume single responsibility for both delivering and managing service. Our solutions help clients meet regulatory requirements, and offers a streamlined approach to maintaining the vast number of instruments and equipment life science & research facilities own. With RENOVO, multiple vendor agreements and services are consolidated into one comprehensive contract. We are accountable for equipment up-time and the ability to reduce your administrative burden. One contract, one cost, one call. Utilizing RENOVOLive®, you have the ability to track each individual piece of your lab equipment and each critical event in the lifecycle of the asset. This powerful, web-based software tool is a comprehensive system that enables life science & research facilities access to service, financial and equipment details of their assets such as service history, Compliance / accreditation tracking, and cost of pass through services. RENOVOLive® can facilitate further cost savings when the performance metrics of equipment is monitored and feedback provided for continuous equipment improvement. The portal can provide metrics to help assess total cost of ownership and manage the lifecycle of assets. Proactive preventive maintenance can extend the life of your assets and reduce lost time due to equipment failure. RENOVO also can provide qualification and compliance services to ensure your equipment is meeting all accreditation standards. 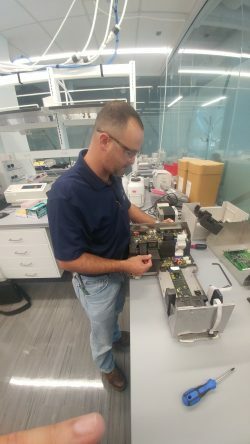 RENOVO SOLUTIONS has multi-vendor trained service engineers that allow us to deliver timely, high quality service on equipment from all the leading manufacturers. The engineers can also perform calibrations and qualification where it’s required. In most full-scale asset management engagements we place an on-site account manager that provides active, direct management and accountability to your service and maintenance needs. Account managers oversee contract management, service management, work-order and inventory management. RENOVO proactively meets with all vendors to ensure continuous, positive outcomes and delivery on behalf of customers.